The Magnolia Hotshots Pambansang Manok and the Alaska Aces continue the championship playoff of the 2018 Philippine Basketball Association Governors’ Cup 7 p.m., today at the Smart Araneta Coliseum. Alaska Aces guard Chris Banchero (4) dribbles past a chasing Magnolia Hotshots import Romeo Travis (24) while Alaska teammates Noy Baclao (right) and Simon Enciso look on. The two squads square off in Game 2 of their best-of-seven showdown with Magnolia looking to follow up its rousing, wire-to-wire 100-84 demolition of the Aces. Following a two-week break to give way to the FIBA Qualifiers, Magnolia looked the better-prepared squad as the Hotshots jumped out of the gates and smacked the Aces right from the opening bell to jump out to a 15-0 advantage. The Hotshots got a surprise lift from Robbie Herndon who drilled back-to-back three-pointers followed by a steal by Jio Jalalon which led to a fastbreak layup by Romeo Travis pushing Magnolia to 15-0 lead to start the game. Alaska cut the gap to 10 points after the first quarter but the Hotshots dictated the tempo of the game from thereon. The Hotshots got a lift from their do-everything import Travis who scored a game-high 29 points. Marc Barroca, Paul Lee and Ian Sangalang were the other double-digit scorers with 16, 14 and 10 points, respectively. Mike Harris led the Aces with 20 points. Chris Banchero chipped in 12 while Jeron Teng added 10. Vic Manuel, playing limited minutes because he was recovering from illness, was limited to just six points. The Aces finished the game with their usual flourish. 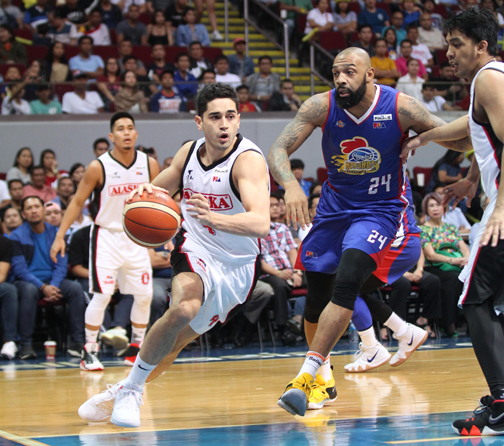 Trailing by 20 points in the fourth quarter, 64-84, the Aces ignited their trademark rally to cut the Magnolia lead. Harris followed up a miss, then Banchero made a fastbreak layup as the Aces trailed by just eight points, 76-84, with 4:23 to go in the game. But that was as close as the Aces would get. Barroca ignited a Magnolia run which pushed the Hotshots ahead beyond recall as Alaska trailed, 76-93. Magnolia defeated defending two-time champion Barangay Ginebra, 3-1, in their own playoff series.